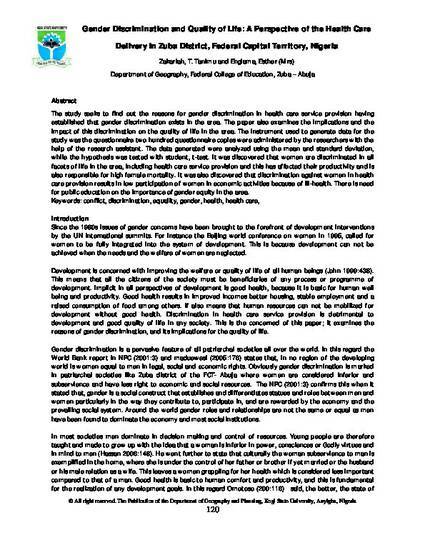 The study seeks to find out the reasons for gender discrimination in health care service provision having established that gender discrimination exists in the area. The paper also examines the implications and the impact of this discrimination on the quality of life in the area. The instrument used to generate data for the study was the questionnaire two hundred questionnaire copies were administered by the researchers with the help of the research assistant. The data generated were analyzed using the mean and standard deviation, while the hypothesis was tested with student, t-test. It was discovered that women are discriminated in all facets of life in the area, including health care service provision and this has affected their productivity and is also responsible for high female mortality. It was also discovered that discrimination against women in health care provision results in low participation of women in economic activities because of ill-health. There is need for public education on the importance of gender equity in the area.